Brown beef and sausage & drain thoroughly. Season with Nature’s Seasoning while browning. NOTE: I’ve discovered from experience that thoroughly draining the grease from meats and the liquid from all beans helps eliminate heartburn and bloated feeling! Add all remaining ingredients except chili beans, kidney beans, & bacon bits. Cover & simmer 3 to 4 hours (until onions turn clear), stirring often. Add beans (only after thoroughly draining) & bacon bits, continue simmering 45 min. to 1 hour, stirring regularly. 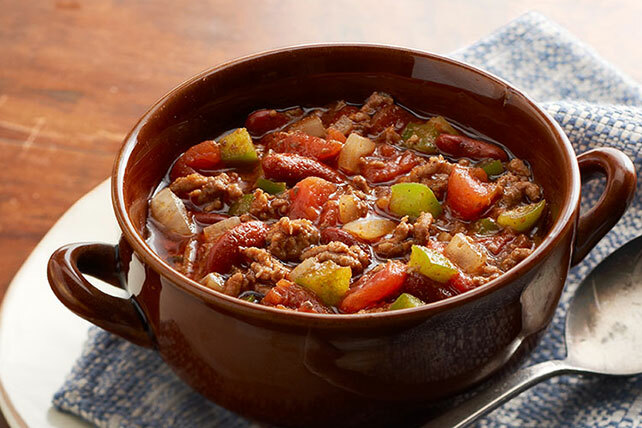 Invite friends over for a chili party, make them addicted to your chili with just one taste, and offer to sell recipe for extraordinarily outrageous sum. I get 50% of all sales. A check or PayPal will be just fine.